When the iPad was announced, cynics scoffed: "It's just a big iPod touch!" It turns out that a big iPod Touch is exactly what a lot of people are waiting for, and not just so they can admire their achingly trendy reflections in its smudge-resistant glass. Here are 10 industries that the iPad would be ideal for. With a wipe-clean surface and few nooks or crannies for brain matter or bodily fluids to get stuck in, the iPad's form factor is ideal for medical applications. It's an area Apple is already in with the iPhone, with applications offering everything from reference to patient monitoring, and US doctors are definitely interested in the iPad. The iPad may not have the horsepower to offer multi-track recording in its own right, but as a control interface for something like the awesome Ableton Live music program it would be perfect for live work. It could also be a kind of mixing console for controlling studio hardware. ON STAGE: As a controller for software such as the awesome Ableton Live, iPads could replace the laptops we often see on stage. Putting textbooks on iPads is a no-brainer - but it's capable of more than that. As North Carolina's Herald-Sun reports, educators are excited about other possibilities including "allowing students and researchers to, say, examine photos and maps as they're checking texts" and even delivering a "cloud-based, disaggregated, open educational experience". Whatever that is. From showing architects' renders while standing in rubble to bringing up house price graphs, reports on local schools or any other relevant data when showing potential buyers a property, the iPad could prove to be a useful tool for estate agents and commercial property firms. PDAs and smartphones are already used to take orders and payments - Apple's EasyPay Touch turns an iPod into a portable payment processor and mobile checkout - but something slightly larger would fit better on a typical retail counter, bar counter or desk. Applications such as Next's online shopping app are a nice idea, but smartphones are just too small for serious sofa-based shopping. Something like this mockup, on the other hand, would be brilliant - and better for the environment than all those doorstop-sized catalogues that retailers like so much. By sales we mean Mondeo-driving, service station-stopping sales. The iPad is an excellent presentation platform, and of course it can be used for order processing and staying in touch with the office, too. When a well-respected productivity software firm such as the Omni Group throws its considerable weight behind the iPad and says the iPad version of its diagramming product is more important than the desktop version, something is definitely afoot. Planning and rejigging priorities tend to happen in face-to-face meetings, an environment the iPad is perfectly suited to. Whether you're deciding whether to award a building warrant, carrying out a safety check on a boiler or assessing the performance of a school, inspections produce enormous amounts of paperwork - most of which ends up plugged into a computer anyway. 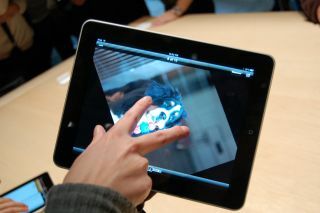 The iPad is much more portable and usable on the move than even the most mobile laptop. Regular viewers of Cops know that laptops often appear in patrol cars, but tablet PCs are a much better idea for the limited space available in police cruisers - and the iPad's comparatively low price could make it very attractive to cash-strapped police departments. Don't get too excited, though: it's more likely to be used for database access and form-filling than for smacking villains.